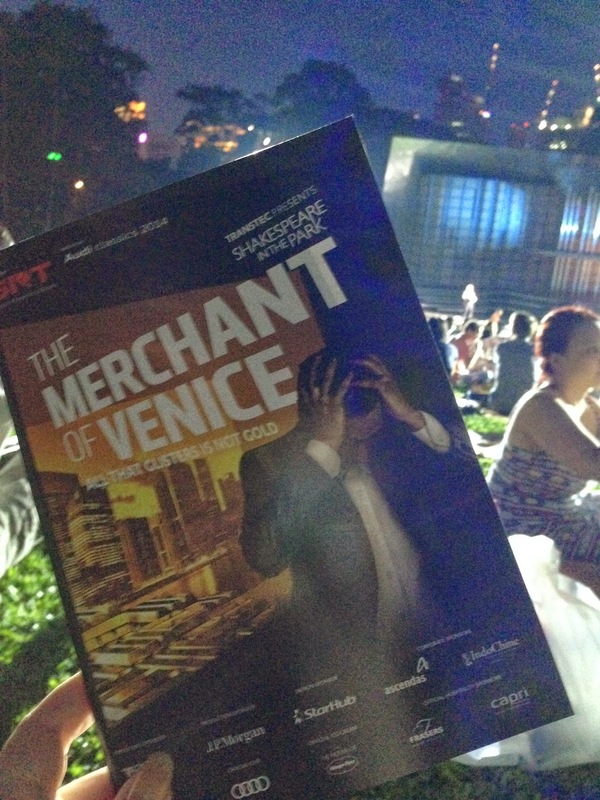 I've been looking forward to watching Shakespeare In The Park - The Merchant of Venice ever since I saw the advertisements all over the columns of Raffles City Shopping Centre as well as the banners on the street lamps. It helped that I studied "The Merchant of Venice" in Secondary 1/2 (I can't really remember) for English Literature. Also, I had a great time at last year's Othello and was hoping for another entertaining evening under the stars. Anyway, true to it's style for all its Shakespeare in the Park plays, SRT's production was a highly modernised interpretation of "The Merchant of Venice". The stage was super modern and had lots of flashing lights and the music was leaning towards techno. Shylock's character was played by an Indian (nice play on stereotypes, although I wonder whether people got the play on how Indians are often called the 'Asian Jew') and the rest of the cast was a mix of all nationalities. Costumes were mainly business attires, gowns and the 'Jews' in the play wore costumes that bear the Nehru collar. I get how they want to modernise it and use modern scenes (cue the bar and cocktails) as well as the clever use of the 3 light stands that rise and fall whenever the 3 caskets were needed/not needed in the scene. What I don't get is the introductory 'dance' scene. It felt too stylised and pretentious in trying to introduce the cast with modern technology such as iPads and what I thought of as Stock Exchange jackets. The choice of music at certain parts were also too jarring and made me too conscious about them trying to fit everything into a modern context. The saddest part was that I didn't feel the chemistry between the cast members. Although there were quite a few kissing scenes, it felt *ahem* too staged (pardon the pun), unlike 'Othello'. The only parts that I quite liked were the scene where the Prince opened the silver casket, only to find a picture of a blinking fool as well as the monologue of Lancelot. I was so bored that I left during the interval. Sorry SRT. I will support you guys year after year but I was not convinced this year. Hopefully the next year would be better.